This domaine consists of 5 hectares planted with Ugni Blanc, Colombard, Folle Blanche and the nearly forgotten Plant de Graisse. The soil is chalky clay and all vineyards are on a slope facing south west. The harvest takes place earlier than what we are used to when making ’normal’ wine, to be able to produce a fine Armagnac, you want to have a high degree of acidity and a low alcohol. After natural fermentation is done, the double distillation takes place at the domaine, in an Armagnac pot still. The cellars are very humid, which favors a long ageing. All the oak barrels are made of wood from the domaine. Bottling is made by hand in the cellars on demand, and this is the moment when the ageing of the Armagnac is fixed. The search for the purest expression of the land is very important to the family, and that what’s they try to create when they make the blending. They would never consider blending to make a ‘standardized’ taste. 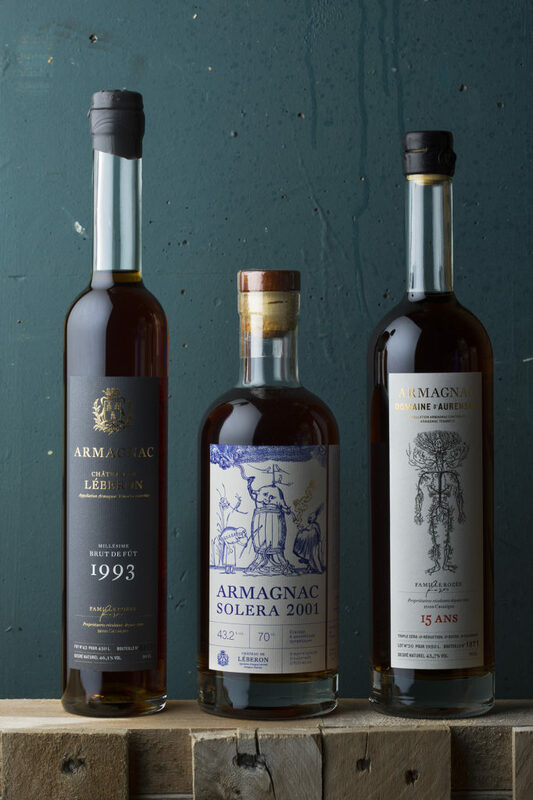 The 20 ans Armagnac bottles today will not taste the same as the one bottled 2 years ago. A very beautiful golden colour with copper tints. The Armagnac is of great aromatic clearness and it has kept a certain freshness. The nose is intense with notes of dried fruits, almond, apricot and stones. The finish is harmonious and generous. Pure, frank and perfectly balanced.